Photo courtesy Jessica Owers, author, Peter Pan: The Forgotten Story of Phar Lap's Successor; © all rights reserved. 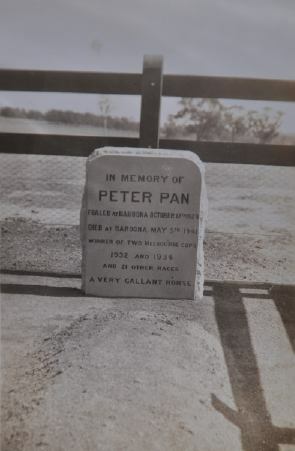 Peter Pan's grave at Baroona Stud. PETER PAN (1929, by imported Pantheon, a good stayer in Great Britain, and out of Alwina by imported St. Alwyne) was one of Australia's greatest stayers, in a country that continues to breed such horses. He was bred, raced and owned as a stallion by Rodney R. Dangar at his Baroona Stud in the Hunter River region of New South Wales. His dam's female line had been in Australasia since the mid-19th century. A big, handsome chestnut with a "silver mane and tail," he was one of the few horses to win the Melbourne Cup twice, at ages three and five (in the latter carrying the heaviest weight), and took twenty-one other high-class races, including the AJC (Australian Jockey Club) Derby, AJC St. Leger, the Melbourne Stakes twice, and the Randwick Stakes twice. Retired to Bundoora after his six-year-old season (1935), he broke his leg in a paddock accident just six years later (1941), and had to be destroyed. With limited opportunities at stud, he got a great stayer in son Peter (Williamstown Cup, VATC Eclipse Stakes) and the winner Precept (Victoria Derby, Moonee Valley Stakes).